Meet Bella. She is the latest addition to the Tn'T family. This little girl made an early appearance in the world and she is still growing in the glass box at Chez Hospital. Her due date was July 4. See? She still has some growing to do! If you'd like to read more about Bella, her very own Momma, Jenn, has been telling us all about her HERE. Bella Marie is the apple of Miss Debbie's eye. And Cat Daddy has never been so smitten! Due to the accumulating hospital bills, a couple of smart blogging ladies have come up with a fund raising raffle idea. Amy at Trailer Trash and Theresa at Garden Antqs Vintage are leading us in this venture. 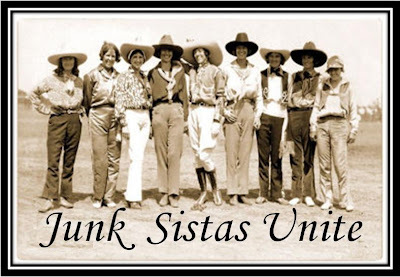 Have you seen the Junk Sistas Unite button on other blogs? We are family, helping out family, don't ya know? At last count, 32 donations had been made for a raffle. Wanna get in on the fun? Go HERE starting May 1 and start buying your raffle tickets. Amy will have links to the donations and you can enjoy perusing the goods. 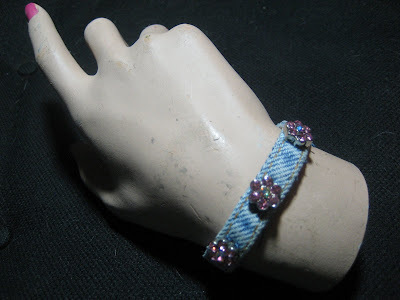 I am donating one of my denim bling bracelets to this raffle. It is blue denim with pink sparkly bling. I betcha Bella likes pink! 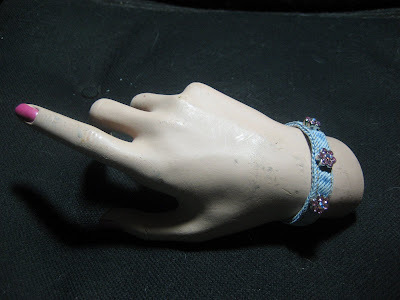 If you win this bracelet, I'll contact you. We'll figure out the best size for you and I will custom make the bracelet for you. And then, I'll ship it to you for free! Doesn't this sound like fun? And what better cause than to help some folks out? Love the bracelet - I can hardly wait to start buying raffle tickets! I don't care about winning I just want to support Bella. Isn't she so alert?! Such a miracle baby. Mindy, When I say I don't know how to thank all of y'all for the outpouring of love, I really mean it. There are just no words for what I am feeling. I keep asking God to give me just the right ones and I know they are coming...I just have to keep listening. In the meantime, from my heart to yours, thank you. Bella, Bella, Bella! Isn't that the prettiest name? Just rolls off your tongue, doesn't it? ---Go to Dogwood Canyon in Lampe, Mo, between Eureka Springs and Branson...take tram ride there...beautiful! ---Have to eat at Lambert's, home of the hand thrown rolls, in Ozark, Mo! This is TOO good! Is it any wonder I love this woman? How great!!! That's very exciting. I'm going to follow that link you posted and find out more. That's a very cool bracelet, Mindy! Bella really is a lovely name, for a lovely little girl. Grow Little Bells. Grow big and strong. Love that bracelet...!!! I am also very excited to be able to help!! What a great cause! Thank you, your post was so beautifully written. I am so glad that you have joined forces with the Junk Sistas! I seem to be following you around here in “blog land” and you always leave the sweetest comments. So I have to tell you what just happened. I had just pulled up your next post (this one) when my four-year old son came in and saw the picture of Bella Marie. He asked who she was and I told him about her. Then he said that Bella was who he wanted to pray for and we proceeded to do just that. (I'm not making this up.) So Bella has been prayed for today, and we hope she grows to be healthy and strong. Bella, may she grow and grow and grow. I wish all the best, full heart and all.